The October 3, 2013 meeting of The Nature Artists’ Guild will take place at the Sterling Morton Library from 7 until 9 pm, where Library Collections Manager, Rita Hassert and Art Collections Assistant (and Nature Artists’ Guild member), Arlene Widrevitz will be donning their white cotton gloves to present us with a selection of artwork from the Sterling Morton Library’s rare print collection. Tony Tyznik, Artist and Landscape Architect for The Morton Arboretum for over forty years, will also be joining us to speak about his experiences in creating his amazing pen and ink illustrations on the grounds of the arboretum. Please click on the following links to find out more about the Sterling Morton Library’s rare print collection, to see a sample of Mr. Tyznik’s artwork, and to read more about Mr. Tyznik. As always, guests and visitors are welcome, and the program and parking are free. Please tell the gate attendant that you are there for the Nature Artists’ Guild Program, and they can direct you to the library. Update – The program was a resounding success. We had a full house at Sterling Morton Library, and although Arlene and Rita did wonderful presentations, the “star of the show” was definitely Mr. Tony Tyznik. He kept us captivated with his charming stories and generously allowed his drawing tools and artwork to be shared for close-up views. 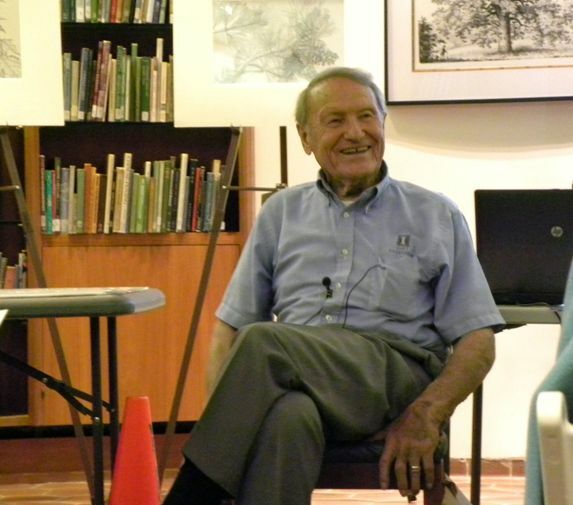 A recurring theme in Mr. Tyznik’s narrative was his gratitude towards those mentors throughout his life, from his early teachers to Suzette Morton, who encouraged him in his artistic path. ← Betty Birdwatcher Needs Your Help!